There are several Oktoberfest events planned in Tucson and Southern Arizona for 2018. Traditionally, in Germany, Oktoberfest is a 16-day festival that starts in late September and runs through October. Mt. Lemmon Oktoberfest One of the most popular festivals is the 2018 Oktoberfest on Mount Lemmon – Enjoy a festival of German food and live German music in the forest at Mount Lemmon Ski Valley from Saturday, September 22-October 14, 2018. This free event features the music local performers and live German bands every weekend. Available food Bavarian Bratwursts, German beer and food. This is one of Arizona’s most authentic Oktoberfest, held in the cool Santa Catalina Mountains. Sponsored by the Ski Valley and the Iron Door Restaurant. The lift is OPEN for rides. The Iron Door Restaurant is serving Breakfast and Lunch. No dogs permitted during Oktoberfest. The weather is 20 degrees of more cooler on top of Mt. Lemmon, bring a jacket if planning to stay through the day. Call 520-576-1400 or 520-576-1321 or visit skithelemmon.com. Trail Dust Town Local beer from Tucson breweries, Iron John’s, Thunder Canyon, Sentinel Peak and Uncle Bear’s Brewing Companies. Polka music with the Bouncing Czechs. 3-9:00 pm Saturday, October 7. Trail Dust Town is located at 6541 E. Tanque Verde. 296-4551. Casino Del Sol Oktoberfest on Saturday, October 27, 5655 W. Valencia Rd. Casino Del Sol is throwing their annual Oktoberfest event from noon – 9 p.m. Forbes Meat Company will be serving up the brats, and there’s also going to be jumbo German pretzels, funnel cake, curry fries, and more. First 300 guests will receive a free Oktoberfest Mug. There is also going to be live music, contests, and plenty of beer. For more information, visit casinodelsol.com. See more Tucson Oktoberfest Events. Check out Halloween Events in Tucson. Return to the Mt. Lemmon Home Page. Read about local authors and their book. Download a free PDF copy of the current edition of Arizona Bookshelf. 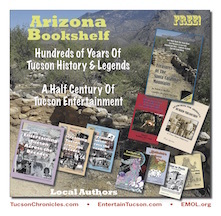 Fifty years of Tucson entertainment, thousands of entertainers and hundreds of bands in Tucson, Arizona between the 1950s into the 2000s. Read chapters and download free PDFsample. 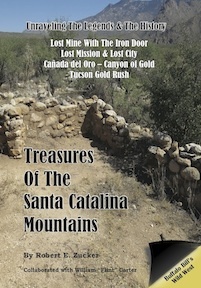 Legends of lost mines, lost cities and a lost mission in the Santa Catalina Mountains, North of Tucson, Arizona, have been passed down by word of mouth for generations. Read chapters and download free PDF sample.